It's bound to be a good morning with Honey Nut Chex™ Cereal, sweetened with a hint of honey and flavored with a touch of almond. 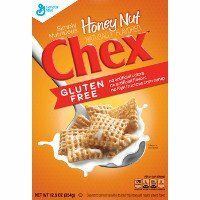 The cereal also stars in these mouth watering recipes: Honey-Peanut Butter Bars and Sweet and Spicy Honey Nut Chex Mix. Dig in and enjoy!